Add the onion and bacon and cook for 5 min. Add chicken and garlic and cook until browned. Stir in the rice, sachet of Fresh Ideas Basil-Chicken Pan and water. Season with pepper and bring to the boil. Pour this mixture into an ovenproof casserole dish and bake for 30 min or until most of the liquid has been absorbed and the rice is cooked. 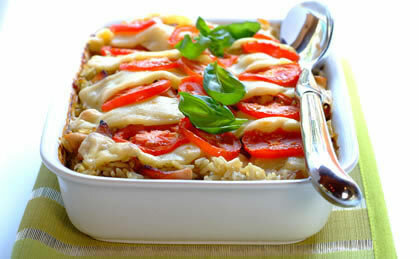 Arrange thin slices of mozzarella cheese and tomato overlapping on top of the rice and place under the grill for 5 min until the cheese begins to soften and turn golden brown. Garnish with basil leaves and serve. YUMMY!!! This entry was posted on May 21, 2010 at 7:07 am and is filed under Uncategorized with tags Bake, Chicken, Mozzerella, recipe, Tomatoe. You can follow any responses to this entry through the RSS 2.0 feed. You can leave a response, or trackback from your own site.